Progressive retinal atrophy (PRA) is a leading hereditary cause of blindness in pedigree dogs as is its counterpart retinitis pigmentosa (RP) in humans. PRA shows genetic heterogeneity, as does RP, with several distinct forms already recognized and several more remaining to be investigated. One can distinguish between late onset forms of PRA and early onset (whelp-age) dysplastic changes. The clinical and ophthalmologic signs of both forms are similar. Affected dogs suffer from bilateral Mydriasis, the reflection of the Tapetum lucidum is increased and the retinal vascular network appears atrophic. The rcd1 mutation causes early onset of PRA whereas dogs with a rcd4 mutation exhibit so called Late Onset PRA (LOPRA) characterised of night blindness as a first symptom of the disease, which starts with two years of live at the earliest. In Irish Setters two mutations for PRA are known, named rod-cone dysplasia type 1 or type 4 (rcd1 or rcd4). 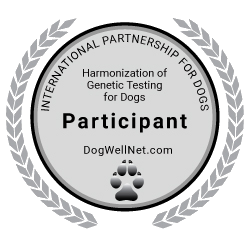 For Gordon Setter only genetic test for rod-cone dysplasia type 4 (rcd4) is validated. In Tibetian Terriers the rcd4 mutation is shown to cause one type of PRA. Further unknown mutations might play a role in hereditary forms of PRA in that breed.